On the one hand, “Fugue for Tinhorns,” from the Broadway musical, “Guys and Dolls” is one of my favorite pieces of music. BTW, Don’t expect anything heavy in this essay: -I may be done with the heavy Op/Ed stuff. OK, in this piece, I hope simply to give you ample reason henceforth to sit and really read the things in front of you. To see an article about horse racing, and not to skim, but instead to drink it in. Because chances are very good that the person who wrote that article, or report or press release–is very intelligent. Probably does know the definition of a fugue. No doubt is a lot smarter than you may think–than Hollywood has painted them to be. The reason that I recommend a good drinking-in is that–contrary to the myth that’s perpetuated by non-racing media (sitcom TV shows, etc. )–the people who write for racing magazines, newspapers, websites and media departments aren’t just a bunch of hacks who couldn’t get another job. That is the myth, and I aim to be the myth-buster. Horse racing writers, across-the-board, are bright people who love horses; they love racing; and they’ve found a way to do what they love and get paid for it. * the knowledge that comes at the other end of being beaten up along the way, and learning from your mistakes. Whichever way horse racing pros get the foundations successfully to perform their jobs–they get ‘er done. Most of the most brilliant horsemen I know learned all they need to know by leaning in–letting a horse whisper into their ears–and learning from the sage equine. For our purposes today, I’m going to focus on those of us who share my passion and my profession. Whichever one’s realm, I posit here that, first of all, not all horse racing pros speak like Joey Bagodonuts. Our clubhouse isn’t on Flatbush Avenue. And the writers who do happen to have accents–don’t write like two unkempt guys on most sports radio, who argue over “Da Metz, who arrrr awl dawgs! 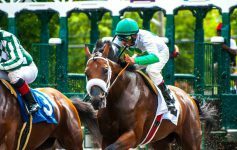 !”Most of us are quite literate, regardless of our accents–Brooklyn or Lexington, Kentucky–and yet, our profession, too, is stereotyped by non-racing media. Either we’re all hard-boiled, chain-smoking beat reporters–or we’re cubs, who really need a wardrobe re-do because that Argyle vest is SO 1930s. I was inspired to pen this tribute to my fellow writers last night, when I was reminded of just how playful racing writers can be. JUST in case you’re not into Norse mythology–or any mythology, for that matter–Loki is a Norse god who has many attributes, not the least of which is his talent for shape-shifting. Isn’t that brilliant? Yummy? I mean, really! Get it: Loki? “…new dimension” = Shape-shifting? I absolutely adored that–it made my day. I love a good play on words–and truly witty play on words really is a gift. I thought this was freakin’ brilliant–in fact, I read the line several times before I moved on to read the rest of the press release. It was then that it struck me, that, in fact, not everyone who reads that line would have caught it. NOT that this made me feel superior–but it DID make me feel like the recipient of a gift. Jenny Kellner edited and wordsmithed the release, as written by Jeanne Schnell. And when Jenny wordsmithed–that is, hammered out, sculpted–that release with Jeanne–she knew that indeed it was a clever, tricky line to throw in there. And that someone–hopefully, many someones–would love it, and smile. We love language, and love to play with it. Words are our tools, just as trainers, farriers and jockeys have their tools. Just as painters, sculptors and musicians have the tools of their arts. We take a word–play with it, toss it around like Play-Doh–and hopefully, that word leads us to other members of their wordy-tribe. We string together these words–create sentences. Or not. We ee cummings it, or we Wordsworth it. But however we write–we horse racing writers all have in common our love of language, and sharing the fun of playing with our words. Of course we hope that you’ll absolutely adore what we produce at the end, but if you don’t–that’s OK, because we love it, and we had fun along the way. Do yourself a favor today: go to the www. of your favorite horse racing publication. Pick up a hard copy (I’m a paper-loving grrrl, myself)–whether magazine, newspaper, website, blog, essay or book–find something about horse racing to read, this very day. Before you read, think about the person who wrote this for you. Then, instead of rushing to get through it–-our world is SO rushed, just slow down–instead of rushing, savor it. Think of it as a lovely meal in a French restaurant. Let each bite roll around in your mind and heart. Say aloud the words that intrigue you, let them roll off your tongue, and out of your mouth into the Universe. Allow the article or book really to get into you--and see if your understanding of horses, horse racing and racing folks doesn’t increase. As the words, themselves, take root in your being–so, too, will a deeper understanding of our amazing sport. Handicapping advice shouldn’t be the place at which you stop studying words on paper, or online. The only thing about horse racing that should take two minutes or under is an actual race. Reading about it should be the equivalent of pulling up a chair at a favorite restaurant, and dining on sensuous, luscious, delicious food for your soul.